CNA Training: What Does A CNA Do and Where Do They Work? If you’re interested in being a certified nursing assistant (CNA), you’re not alone. With an increasing population in the United States, the Affordable Care Act, and an aging population, more CNAs are needed than ever. Whether you want to use it as a stepping stone to becoming a nurse or are perfectly happening to get your CNA certification and stopping there, Northern Colorado Training Institute would love to help you get your CNA training. Is being a CNA for you? What does it take to become a CNA? Let’s take a deeper look at what it means to be a certified nursing assistant. 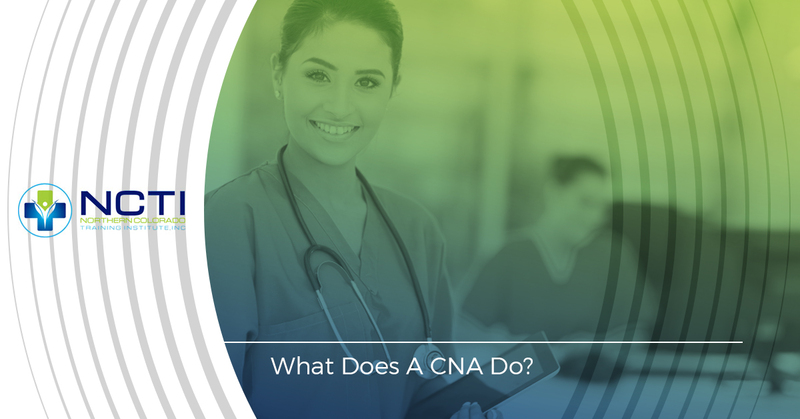 What Do You Need To Become a CNA? One of the most appealing aspects of becoming a CNA is that it doesn’t require much training, so you can head out about your certified nursing assistant training and should have a job in no time. First, you’ll need a high school diploma or a GED. After that, you can contact us here at Northern Colorado Training Institute to begin your CNA training. Classes take between six to twelve weeks. After that, you’ll need to take a state test in order to be licensed to provide CNA services. One great part of being a CNA is that you’ll be in demand at an array of care facilities. The first is hospitals, of course, which is where you’ll find most nurses. This includes working at hospitals large and small, specialty centers and urgent care. CNAs are also being used more frequently at senior care facilities, with additional nursing homes and elder care communities going up all the time. Certified nursing assistants spend nearly their entire day with patients. CNAs assist patients with tasks such as eating, bathing, and dressing, as well as helping them use the restroom. You’ll also be taking care of other basic needs throughout the day, such as taking vitals and helping nurses with their duties. There will also be paperwork to deal with, as well as collecting patient’s personal information and logging it appropriately so that the nurses and doctors can access it. The night shift might be different but still very active. There are call lights to be answered, as well as providing help to patients who might be calling out. If you’re working in a nursing home, it’s important to remember that the elderly don’t always sleep well, so you’ll be helping them get through the night. It shouldn’t be too difficult to get a job as a CNA. In fact, there’s a huge demand for them as baby boomers get older. In the next 10 years, there are going to be hundreds of thousands of CNA jobs being created, which means that there’s going to be a lot of opportunities no matter what state you live in. You’ll always have job security working with the elderly! Being a CNA takes a lot of heart, and if you like taking care of people then it might just be the job for you. We won’t lie and tell you it’s always going to be easy. Being a CNA is hard work, and it takes a special person to be one. The pay is just okay — averaging just over $30,000 a year — but it can be a great option if you’re interested in a full-time job that comes with good benefits. If you’re interested in becoming a CNA, we’re ready to help you. Simply contact us to get the process started!